The model CTR2000 precision thermometer comprises two measurement versions: One version accepts only 4-wire PRTs, the other version accepts both 3- and 4-wire PRTs. The high-performance 2- or 8-channel, 3- and 4-wire precision digital thermometers is suitable for use with calibrated and uncalibrated Pt100 probes. It is characterised by its extended features for high usability and low life costs. 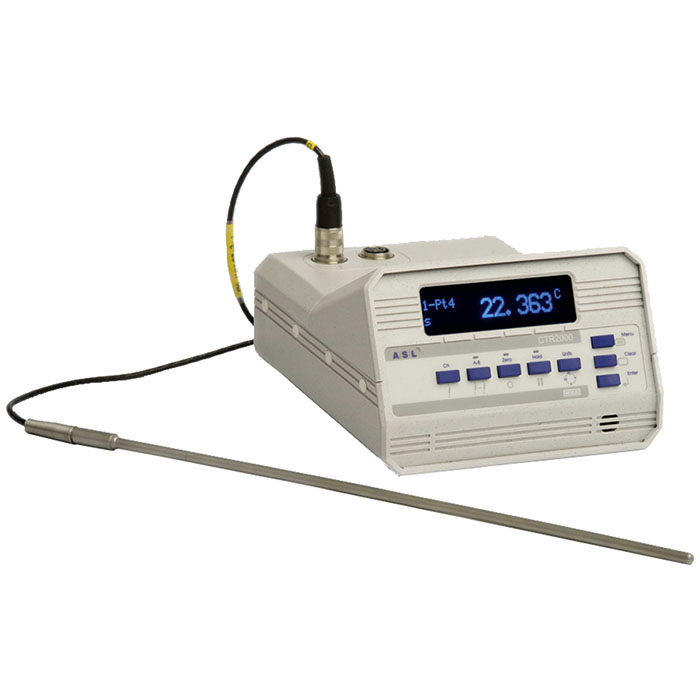 Using calibrated probes with the CTR2000 thermometer series choose between storing calibration data into memory in the instrument or into the probe’s proprietary SMART connector. Calibration data stays permanently with the probe in this connector, which the CTR2000 series instantly recognises, ensuring best measurement accuracy. Using a built-in calibration routine, the CTR2000 instrument range can be recalibrated using a calibrated, traceable reference resistor. This feature is password protected. Other features have been included for CTR2000 range when using SMART probes, like the temperature watchdog and the calibration status monitor. The temperature watchdog continuously monitors the temperature of SMART probes and, if any are used outside their specified working range, the probe history record is updated. With this way, it can be seen at a glance if the probes have ever been used outside their calibrated range, as this may affect their calibration validity. The calibration status monitor alerts with an on-screen message when a SMART probe is due for recalibration.